when we came to tea. My Grandma Rose was an amazing woman, who made each of her grandchildren feel precious to her. It's a gift few have. This is one of the two photos I have of Grandma with me. 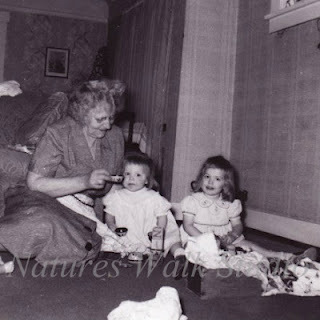 My older sister Janie and I were having a tea party with Grandma. I cherish this photo. Grandma survived the death of three sons in WWII, and her husband in a trucking accident, all within a few years. She was a strong woman who raised the remainder of her children as a single parent, including my mother, the baby of the family. We lost Grandma when I was eight years old, but she has never left my mind. I've always considered her my guardian angel. If you look closely, you can almost see her wings. I definitely see her wings! In our unique living situation of having our Grandchildren living in our home for the time being, I see the interaction of Grandma, or Na as she is referred to here in Spadoville, and the four children. I have witnessed amny a tea party. Every child has had her presence throughout any kind of triumph or trauma. I hope thatb they have the same kinds of loving memories that you have when they get older and raise families of their own. This page today is a very pleasant place to be. I love your sharing of Grandma Rose today. Grandmas are special. I too, lost my Granny at age 8. Tea parties are special, too. You were blessed with a caring and wonderful grandmom. Thank you for sharing her with us. Lovely picture. I love that you remember your Grandma as you do, with her wings. I think we all have such great memories of Grandma's and Grandpa's. Thank you for sharing. what a great photo of grandma! She must have been a tough woman to go thru all that sorrow and raise her daughter alone. Oh I could see her wings. How wonderful to have tea parties with Grandma. Her wings are clearly visible but I also see them on you and your sister. What a beautiful tribute to your grandma--and as a grandma myself, I can only hope that my own beloveds will remember me one day as you've remembered your grandma. before i read a single word i sat drinking in the essence of your grandmother. i saw her wings immediately. so lovely! thank you for this tender straight to my heart memory of your grandmother and the place she resides forever in your heart. i shared your beautiful winged grandmother today! once again i have shared your profoundly touching memory of grandma rose in my art of remembering. i want to thank you for your constant inspiration and friendship. may your day be filled with cherished memories. this morning i have once again shared your amazing memories of angels and wings. postcards from paradise is once again dedication each sunday in october to The Art of Remembering. i cannot begin to tell you how deeply moved i am with this outpouring of love, and i hope you will return to woo us once more with your stories! please invite your blog family, the more stories, all the more love igniting our hearts!